First of all, I want to wish you all Happy New Year. I wish you a lot of health, love, friendship, money, and all the things that make you happy. I also want to wish you a lot of stardollars, starcoins, rares, limited items, Stardoll achievements, and whenever else you want. And of course, I wish you to keep reading this blog and my column amongst other posts. Here goes another post of the mentioned column. The week started with the release of Saint Laurent Paris Tribute collection. This collection is, according to Stardoll, final Tribute release for the season. I am surprised we didn't get the decor collection, like we usually get on the last release. Not that I am complaining, I am loving this collection, and I am free to say this is my favorite collection from this Tributes season. It has a nice amount of LBDs, in a variety of shapes and patterns. It also has a lot of nice, wearable clothes that can spice up anyone's wardrobe. Accessories too. On Wednesday, we got new Callie's Picks collection, named 'Faux Fur'. Wow, so much fur at the so small collection. Seriously, almost half of the pieces, if not more, are furry. I don't like it. I am not fan of fur, like I mentioned several times, neither on Stardoll or real life. 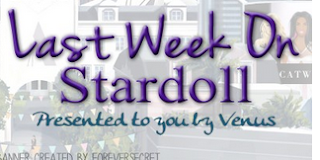 I like that Stardoll is insisting on 'faux', and 'animal friendly', not encouraging younger members to buy real fur. Kudos for Callie (or whoever is behind the idea). Prices are kinda high, and we got 3 items for Royalty members only, and 4 superstar only pieces! Wow, this never happened before on CP. They re-released several quite rare items, making some members angry of their rares losing value or they paid too much for things that got re-released for a fraction of price. But I am saying it again, you are aware of Callie re-releasing stuff, it is your choice to invest in pieces you like, and take the risk. On the final day of last year (Thursday), as expected, Stardoll made all HotHotBuys available to be bought. A great chance for people who were low on stardollars and had to wait new month to buy stardollars/superstar, or buy stuff they missed, maybe because they were having second thoughts, who can tell? Anyway, I love the idea, and I did snag few items I forgot to buy before. It is nice they were available until January the 2nd, so I hope you snagged what you wanted. This HHB were ok, with a bit too many Chanel inspired items, but some freebies and gifts for buying stuff. Prices were kinda high, of course. But it is time to say goodbye, and get ready for monthly HotBuys. And finally, on the first day of a New Year, we got new interior collection in Sweet Suites. The collection is inspired by Kardashian/Jenner real life houses. Wow, what a way to start a New year.. No offense, but I am not a huge fan of those celeb families. Not fan at all, to be exact. But we are here to talk about collection, right? Well, it is a bit 'over the top', I don't know, but it just seems too kitsch for me, just not my style, even if I wanted to decorate my suite. Though I do love some pieces, like blue heels, (too bad they aren't wearable), blue bag (wearable, but ss only - I'll get my hands on you eventually), and maybe the mirror, in case I ever decide to decorate my suite. That's all, I hope you all enjoyed my recap, (or just scrolled down to a poll). Anyway, vote, comment, and see you next week.